Professor Louie received his Ph.D. in physics from the University of California at Berkeley (UC Berkeley) in 1976. After having worked at the IBM Watson Research Center, Bell Labs, and U of Penn, he joined the UC Berkeley faculty in 1980, where he is professor of physics and concurrently a faculty senior scientist at the Lawrence Berkeley National Lab. 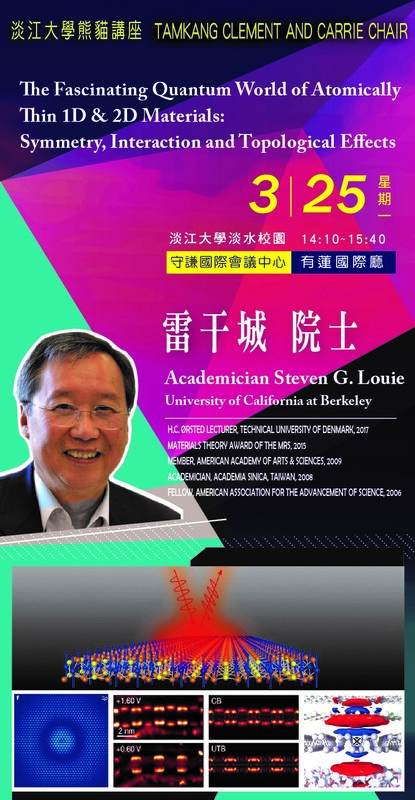 He is a member of the National Academy of Sciences, the American Academy of Arts & Sciences, and the Academia Sinica (Taiwan), as well as a fellow of the American Physical Society (APS) and the American Association for the Advancement of Science. Among his many honors, he is recipient of the APS Aneesur Rahman Prize for Computational Physics, the APS Davisson-Germer Prize in Surface Physics, the Materials Theory Award of the Materials Research Society, the Foresight Institute Richard P. Feynman Prize in Nanotechnology, the U.S. Department of Energy Award for Sustained Outstanding Research in Solid State Physics, as well as Jubilee Professor of the Chalmers University of Technology in Sweden and H. C. Ørsted Lecturer of the Technical University of Denmark. Professor Louie’s research spans a broad spectrum of topics in theoretical condensed matter physics and nanoscience. He is known for his groundbreaking work on the ab initio GW method and for his seminal work on surfaces and interfaces, nanostructures, and reduced-dimensional systems.